BUNDLE!!! 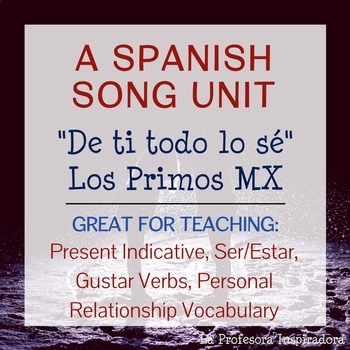 Spanish Song Units for Novice Learners!!! This packet includes all you need to do a complete lesson on "De ti todo lo sé," by Los Primos MX. This is an excellent song to use for a comprehensible input activity with authentic cultural materials in lower-level Spanish classes, as its vocabulary and grammatical structures are simple and repetitive. The love theme would make this a great choice for a Valentine's Day activity! ❊ "Se" pasivo y "se" impersonal: A PowerPoint on the Passive and Impersonal "Se"
❊ El bestiario: A Spanish Cultural Lesson on Mythical Medieval Creatures!